A rotary tiller, also known as a rototiller, rotavator, rotary hoe, power tiller, or rotary plow (rotary plough in British English), is a motorized cultivator that works the soil by means of rotating tines or blades. Rotary tillers are either self propelled or drawn as an attachment behind either a two-wheel tractor or four-wheel tractor. Small, self-propelled rotary tillers are used in domestic gardens. When attached to two-wheel or four-wheel tractors, rototillers are used on farms. In addition, rotary tillers have been used to clean the exterior of oilfield pipes and to prepare the ground for road construction. The powered rotary hoe was invented by Arthur Clifford Howard. In 1912, he began experimenting with rotary tillage on his father's farm at Gilgandra, New South Wales, Australia. Initially using his father's steam tractor engine as a power source, he found that ground could be mechanically tilled without soil-packing occurring, as was the case with normal plowing. His earliest designs threw the tilled soil sideways, until he improved his invention by designing an L-shaped blade mounted on widely spaced flanges fixed to a small-diameter rotor. With fellow apprentice Everard McCleary, he established a company to make his machine, but their plans were interrupted by World War I. In 1919, Howard returned to Australia and resumed his design work. The following year, he patented a design with five rotary hoe cultivator blades and an internal combustion engine. In March 1922, Howard formed the company Austral Auto Cultivators Pty Ltd, which later became known as Howard Auto Cultivators. It was based in Northmead, a suburb of Sydney, from 1927. Finding it increasingly difficult to meet a growing worldwide demand, Howard traveled to the United Kingdom, founding the company Rotary Hoes Ltd in East Horndon, Essex, in July 1938. Branches of this new company subsequently opened in the United States of America, South Africa, Germany, France, Italy, Spain, Brazil, Malaysia, Australia and New Zealand. It later became the holding company for Howard Rotavator Co. Ltd. In 1985, the Howard Group of companies was acquired by the Danish Thrige Agro Group. About five years later, in December 2000, the Howard Group became a member of Kongskilde Industries of Soroe, Denmark. A small rotary hoe for domestic gardens was known by the trademark Rototiller and another, made by the Howard Group that produced a range of rotary tillers, was known as the Rotavator. 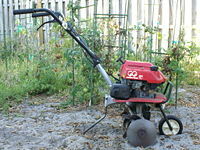 Rotary tillers are popular with home gardeners who want large vegetable gardens. The garden may be tilled a few times before planting each crop. Rotary tillers may be rented from tool rental centers for single-use applications, such as when planting grass. The small rototiller is typically propelled forward (via 1-5 horsepower petrol engine or .8 - 3.5 kilowatts) by the rotating tines and do not have powered wheels, though they may have small transport/level control wheel(s). To keep the machine from moving forward too fast, an adjustable tine is usually fixed just behind the blades so that through friction with deeper un-tilled soil, it acts as a brake, slowing the machine and allowing it to pulverize the soils. The slower a rototiller moves forward, the more soil tilth can be obtained. The operator can control the amount of friction/braking action by raising and lowering the handlebars of the tiller. Rototillers do not have a mechanism to operate it in reverse, because such backward movement could injure the operator seriously. During operation, the rototiller can be pulled backward to go over areas that were not pulverized enough, but care must be taken to ensure that the operator does not stumble and pull the rototiller on top of himself. Rototilling is much faster than manual tilling, but notoriously difficult to handle and exhausting work, especially in the heavier and higher horse power models. 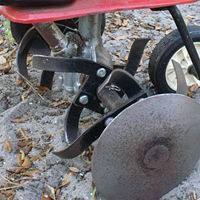 If the rototiller's blades catch on unseen sub-surface objects, such as tree roots and buried garbage, it can cause the rototiller to abruptly and violently move in any direction. Unlike the Rototiller, the self-propelled Howard Rotavator is equipped with a gearbox and driven forward, or held back, by its wheels. The gearbox enables the forward speed to be adjusted while the rotational speed of the tines remains constant which enables the operator to easily regulate the extent to which soil is engaged. For a two-wheel tractor rotavator, this greatly reduces the workload of the operator as compared to a rototiller. These rotavators are generally more heavy duty, come in higher horsepower (4-18 horsepower or 3-13 kilowatts) with either gasoline (petrol) or diesel engines and can cover much more area per hour. Interestingly, the trademarked word "Rotavator" is one of the longest palindromes in the English language. A rotary tiller for agriculture. Two-wheel tractor A rotary tiller may be rigidly attached to a two-wheel tractor and powered via couplings to the tractors' transmission. The higher horsepower "riding" rotavators cross out of the home garden category into farming category especially in Asia, Africa and South America, capable of preparing 1 hectare of land in 8 to 10 hours. These are also known as power tillers, walking tractors, or two-wheel tractors. Years ago, these tillers were considered useful only for rice growing areas, where they were fitted with steel cage-wheels for traction. Now, however, the same types of tillers are being used in both wetland and dryland farming all over the world. Compact, powerful and (most importantly) inexpensive, these agricultural rotary tillers are providing alternatives to four-wheel tractors, and for the small farm fields in developing countries, they are more economical than four-wheel tractors. Four-wheel tractor A rotary tiller may be attached to a four-wheel tractor by means of a three-point hitch and driven by a power take off (PTO) shaft. Generally considered a secondary tillage implement, it can and is commonly used for primary tillage. It can also be used for cultivation between rows of vines, and similar uses. Rotary tillers can also be used for the construction of roads. Beginning in the 1970s or 1980s, hand-operated rototillers were modified to clean the exterior of oilfield pipes. These pipes, either new or used, with diameters ranging from about 2 inches to more than 30 inches, were used in the exploration, drilling and production of oil wells. The modified rototillers replaced hand tools used for cleaning, but they were ultimately supplanted by machinery that cleaned entire pipe lengths within a few years. In the modified version used for cleaning pipes, the tines were replaced with wire brushes. The tool was used by a man walking the length of a pipe (typically 30 or 40 feet), as the pipe was rotated. A rotary tiller needs to be operated and maintained with proper care. It is important to avoid contact with the rotating tines, as they can cause serious injury. Bystanders, especially children, should be kept at a safe distance. Tree stumps, large roots, and rocks should be cleared out before using the tiller, as the tines could catch on such objects and cause the tiller to "jump" out of control. Given that a rotary tiller digs up the soil, its engine oil and filter need to be changed regularly. The recommended interval for oil changes is at least once a year or after 50 hours of use, or more often if the oil appears dirty. In addition, the air filter needs to be cleaned or replaced often, and the tines and housing should be washed after each use. ↑ 1.0 1.1 1.2 Diane Langmore, Howard, Arthur Clifford (1893 - 1971), Australian Dictionary of Biography, online edition, Australian National University. Retrieved November 19, 2008. ↑ Donald Antique Roto Tillers, The Howard Rotavator. Retrieved November 19, 2008. ↑ ag Machine, Machinery Manufacturers—Secondary Tillage, Worldwide Agricultural Machinery and Equipment Directory. Retrieved November 19, 2008. ↑ 4.0 4.1 LSU, Rotary Tiller Safety and Maintenance, LSUAgCenter.com. Retrieved November 19, 2008. Baker, Jerry. Jerry Baker's Fast, Easy Vegetable Garden. New York, NY: Plume, 1985. ISBN 0452281040. Intertec Publishing Corporation. Rotary Tiller Service Manual, 3rd ed. Overland Park, KS: Intertec Pub. Corp, 1989. ISBN 0872883531. Kubik, Rick. How to Use Implements on Your Small-Scale Farm. Motorbooks Workshop. St. Paul, MN: Motorbooks, 2005. ISBN 978-0760321676. Rogers, Marilyn, and Kathleen Bond Borie. Yard & Garden Owners Manual: Your Complete Guide to the Care and Upkeep of Everything Outdoors. Des Moines, IA: Better Homes and Gardens Books, 2004. ISBN 0696217600. Rotary Tiller Safety and Maintenance. LSUAgCenter.com. This page was last modified on 19 July 2015, at 19:35.